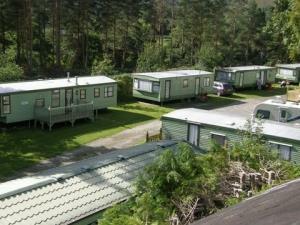 The Pines Caravan Park01597 810068work Holiday ParkA David Bellamy Gold Award winning Caravan park (for last 10 years). The Pines is situated on the old railway line, closed following the Beeching Report in the 1960's. The Reception is in fact the old Railway Station House & booking office. A very pleasant walk along the banks of the River Wye is easily accessible from the lower level of the park. Red Kites are a very common sight here, with a feeding station at Rhayader only 3 miles away. Well equipped, modern holiday homes with one caravan equipped to be wheelchair friendly. Holiday Homes are also available for purchase. Is situated close to Rhayader and only 7 miles from Llandrindod Wells in Mid Wales offers a peaceful place to holiday amongst the beautiful Welsh mountains. Whether taking one of the many walks or more energetic bike rides around the Elan Valley Reservoirs and Dams keep your eyes open for the wildlife, the Red Kite is a common sight here for the bird-watchers amongst you. Our caravans are all fully equipped for self catering, with a cafe within easy walking distance if you prefer to eat out during the day. A David Bellamy Gold Award winning Caravan park (for last 10 years). The Pines is situated on the old railway line, closed following the Beeching Report in the 1960's. The Reception is in fact the old Railway Station House & booking office. We offer mid week or weekend breaks as well as full weeks, with a modern purpose built wheelchair accessible caravan available for hire. Leisure facilities available in Rhayader 3.5 miles. Golf courses 7 & 10 miles. Shop/cafe 50 metres from Park entrance. Children welcome from any age. Situated on the A470, 3.5 miles south of Rhayader (10 miles north of Builth Wells). next to the Gulf petrol station. Nearest railway station - Llandrindod Wells 7 miles.